"DT Systems SPT-2432 Brand New Includes One Year Warranty, The DT Systems SPT-2432 Professional 2-Dog Training Collars considered to be their best, especially since they have added the new Jump and Rise Technology. Easy one hand held transmitter operation allows for maximum control and safety. 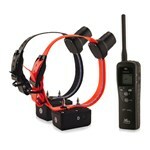 The training collar features 50 Levels of continuous and momentary stimulation instantly selectable at the transmitter, has 1.3 mile range and beeper/locator as well. The SPT-2432 represents the absolute latest technological advancement in the Electronic Dog Training World offering Maxx-Range internal collar antenna system and Gentle Touch system for extra mild stimulation. SPT-2432 Features: Remote Trainer, 2-Collar System, Fits Up to 23"" Neck, Up to 1.3 Mile Range, 50 Levels of Momentary & Continuous Stimulation, Digital Technology to Maximize Power, Built-in Safety Shut-Off, LCD Screen On Transmitter, Built in Magnetic On/Off System, Maxx-Range Internal Collar Antenna System, Gentle Touch Extra Mild Stimulation, Positive Vibrations, Jump & Rise Stimulations, Integrated Beeper/Locator, Completely Waterproof Transmitter & Collars, Rechargeable Ni-MH Battery System, Includes: 2 Training Collar, Transmitter, Antenna, Charging Unit, Charger Splitter, Test Light, User Manual, Training Manual, FREE Hard Case, FREE Lanyard"